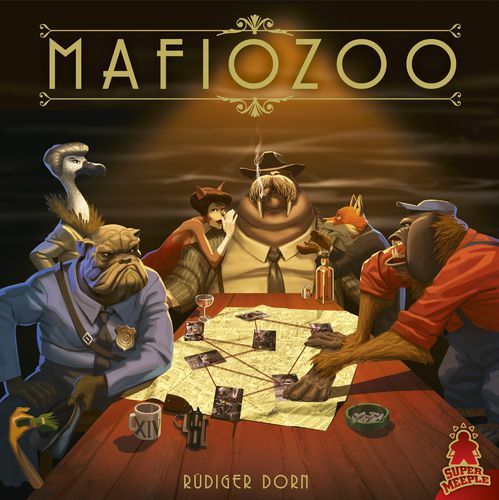 In Mafiozoo, players are vying to be the next member of Wally Longtooth’s gang by gaining the most influence over important members of the local anthropomorphic crime network. The game is a revision of an old classic, Louis XIV. While I was at first unsure whether Louis XIV needed a new version, discussion amongst some local gamers has shown me that there are many gamers new to the hobby who haven’t had the chance to play the original version. For a quick review of the original game, let me point you to a review written by the OG’s resident Dorn fanboy, Larry Levy: https://boardgamegeek.com/thread/133466/louis-xiv-my-designer-king-does-sun-king (It will be helpful to be a little familiar with the first version as some of this review will be referencing likenesses and differences from that version. In this game, the large board is split up into three areas. 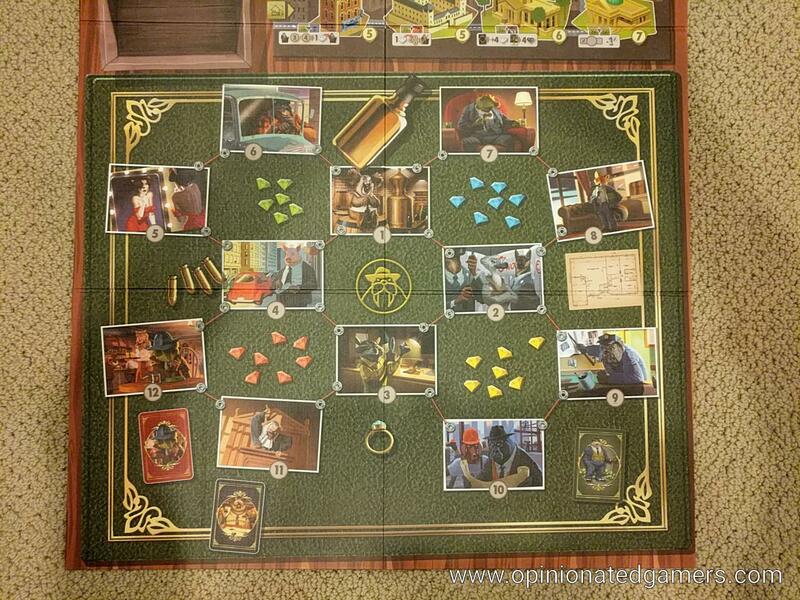 The bulk of the board is a green desk blotter which shows pictures of 12 crime lords. There are red lines which connect the pictures at the corners. 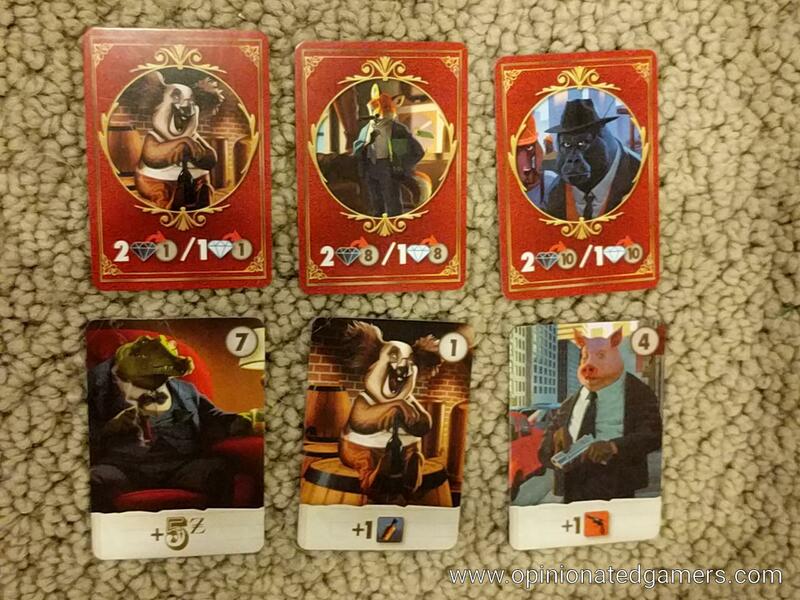 Each picture is numbered, and there is a tile which will be placed at the bottom of each picture to tell you how you can gain the influence of the animal mobster. The reward for the influence is also shown on the token. Some of them will give you Favor Tokens while others may provide money or other benefits. The top of the board has a map of the city, with 12 buildings in a 4×3 grid. Each of these buildings can be occupied by a player’s goon; and if so, there is a reward on that building which the player can take advantage of. Finally, in the upper left, there is a small area for neighborhood tokens. There will always be 5 of these tokens face up there, and the rest will be hidden in a bag. At the start of the game, each player puts their gems on their storage space on the board. Each of the twelve gangsters on the blotter gets a token put down to show how they are influenced. Favor tokens are also placed on their respective spots. Five neighborhood tokens are pulled from the bag. The Informant cards are shuffled and placed near space #12, and the Bribery cards are placed near space #11 – you will earn these cards at those spaces. The starting player and second player each take 11 gems from his supply on the board to put in his personal supply. The third gets 10 and the fourth gets 9. Each player starts with 5 Dollars. The game is played over four rounds, with each round having the same four phases. 1) Revenue, 2) Bribery, 3) Favors, 4) Influence. In the revenue phase, a Godfather card is revealed. This card will tell you which of the central mobsters (#1-4) to place the Godfather on, and how many dollars each player gets for that round. Then, the Bribery deck is shuffled and each player gets dealt five cards. 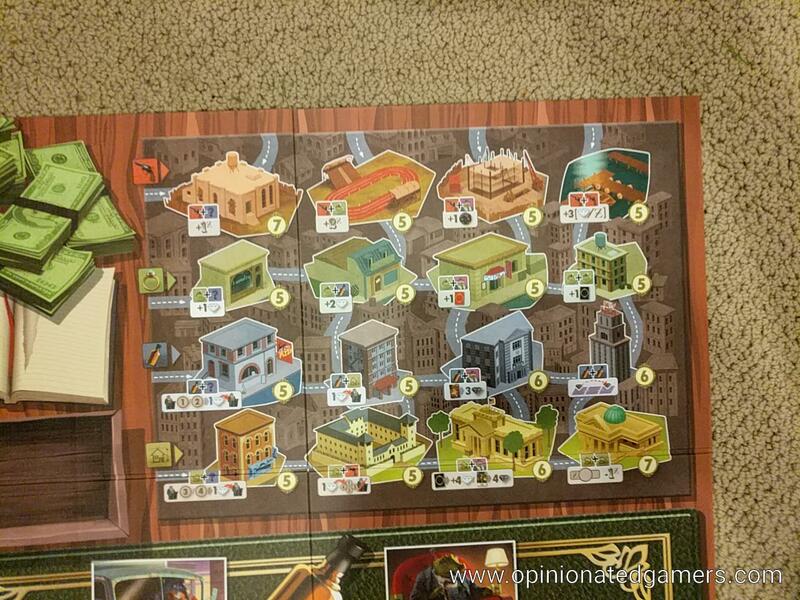 Then, each player looks at the city map in the upper right board and takes any benefits that they would receive. Obviously in the first round, no one will get a bonus as there are no goons on the board to start the game. In the Bribery phase, players take moves in order. Starting with the start player, players will play a Bribery card from their hand and then make an appropriate action with it. Each player will continue to play cards until the have one card left in their hand. This final card is then discarded. It may turn out that players have different numbers of cards in their hands at the start of the round; if so, players will play an uneven number of turns as well. Most of the Bribery cards have a picture of one of the twelve mobsters on it. When you play these cards, you have the option of either moving 3 gems from the board supply to your personal supply OR you can play up to 3 gems from your personal supply to the board. When you play to the board, at least the first gem must go onto the space depicted on the card. You may then follow the red strings to place the second (or third) gem on adjacent spaces. The other type of card is a wild card, which shows a version of Dogs Playing Poker. If you play this card, you can move up to 2 gems from the board supply to your personal supply OR you can place up to 2 gems on the board, starting on any of the twelve mobsters. As you play the card, you discard it. If you only have one card left in your hand after the discard, you also discard the remaining card – you never play the final card in your hand. Play continues around the board until all players have emptied their hand. Then the game moves into the Favor phase. In this phase, the twelve mobsters will be evaluated in number order. There are three different methods that a space is evaluated – and the method is shown on the scoring chit that was placed on the space in setup. 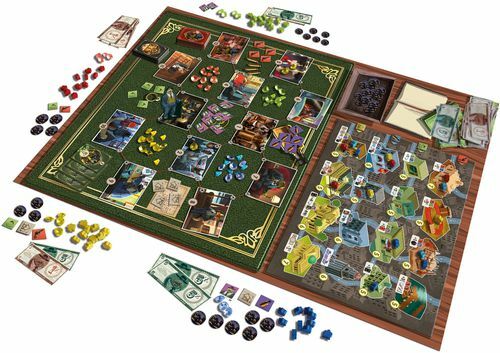 As you go around the board, make sure to ask all players if they wish to play an informant token for the space in question – there is one card for each space, and when played, the card allows that player to place 1 gem from the board supply or up to 2 gems from the personal supply onto that space. A] To the highest bidder – in this space, the player with the most gems in the space will get the reward of the space. If there is a tie, no one wins. The winner’s gems are returned to the reserve area on the board. All other players get nothing, but they do get to take their gems back into their personal supply. B] For cost – in this space, if there is a player who has more gems than any other player, the winner gets the reward for free, but his gems are returned to the reserve area on the board. All other players have the opportunity to purchase the reward as the cost shown on the token. In addition, they take their gems back into their personal supply. C] For gems – in this space, any player who has placed at least the number of gems shown on the token will gain the bonus for the space AND they are able to take their gems back into their personal supply. There is one other case – one of the four central spaces (#1 thru #4) will have the Godfather token on it (the location of this was decided by the flip of a Godfather card in Phase 1 of this round). In this space, if a player has placed more gems than any other, he will win BOTH the reward of the space as well as a Godfather token. If there is a tie for most, the tied players will all spend their gems and get the reward for the space, but will NOT get a Godfather token. If no tie for first, the player with the second most gems on the space will win the reward as if he had placed the most. He will get his gems back in this case though. 12] Get a Informant card, also draw a Neighborhood token. Anytime that you are able to take a Neighborhood token, you have two options, you can choose one of the five face up ones or draw a random one from the bag. Always replenish the face up supply to five after drawing. As you collect the tokens, you may keep them face down in your area. The final phase of the round is the influence phase. 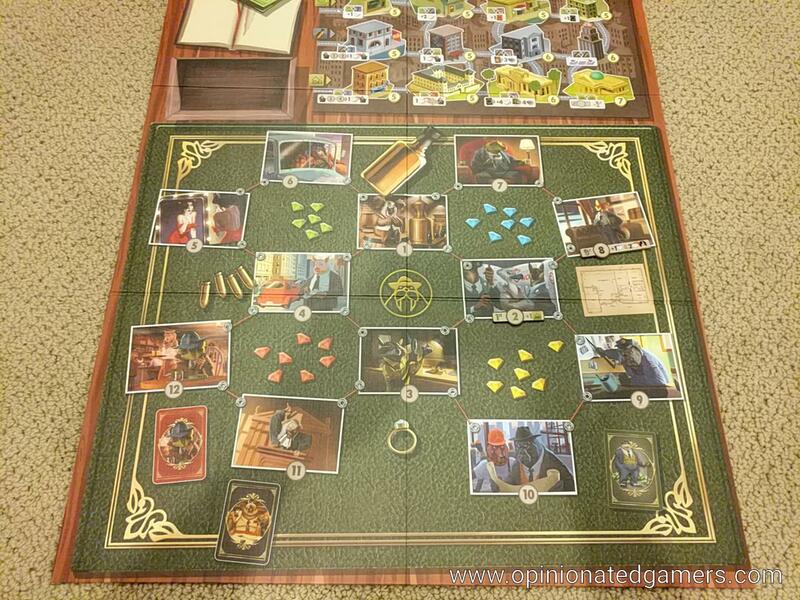 The action takes on the city map in the upper right of the board. Initially, you can place your goons on the 7 buildings on the upper and left sides of the map – these all have access roads leading to them. Once you have a goon on the board, you can then place onto any other interior buildings which are connected by roads. Each of the buildings has a special action – some give you extra income in Phase 1, while others give in-game bonuses as certain parts of the game. Each building also has a VP value, between 5 and 7 points. The cost to place a goon is always a pair of bonus tokens. Remember, you can use a Godfather token as a wild card for any other token, but there are also a few places where you MUST use a Godfather token. You may only place one goon on any particular building, and once placed, it never moves. You generally would like to place as many goons as possible because you must discard down to a single Favor token in hand at the end of this phase. All extra tokens are returned to the supply. This same pattern is completed for four full turns. At the end of the fourth round, there is a bit of end game scoring. First, reveal all of your collected Neighborhood tokens. Only these tokens collected in-game are used for color bonuses. Now you will get a bunch more tokens, but all of these will be placed facedown (so you don’t choose them – it has no bearing on the bonuses). Take 1 facedown token for each: bribery card earned in the last round, informant card in your hand, each favor token left over, each of your gems which remains on the board at the end of the game, and each 3 dollars you have. Now, you can calculate your score. Score 1 bonus point for each set of 6 different face up tokens. Then go through each of the six colors and award 1 bonus point to any player who has more tokens of that color than any other player. Then score 1VP for each neighborhood token that you have. Finally, score VPs as shown on each building where you have a Goon. The player with the most points wins. Ties go to the player with the most gems in his personal supply at the end of the game. Well, I really liked the original version of the game, and when it came out, I was captivated by its mix of complexity and elegance. The game remains meaty as ever, and it still plays in about an hour. This new version is fairly similar to the original – the difference here is that the end game scoring is done on a visible map as opposed to a random draw from three decks of Mission cards. The Neighborhood scoring also seems a little less swingy, but there is still a fair amount of luck in that part of the game. You constantly have tough decisions to make, and having to deal with multiple majority contests in the gem placement phase keeps you on your toes. The game is obviously very tactical as you are first limited to the random draw of cards that you get, and you need to try to keep your options open to allow you the best chance to react to the moves that your opponents make. Sure, I suppose that you could get hosed if you had a terrible draw of cards, but the way that the bonuses are spread around the board and the way that you can string locations together while playing gems really does seem to mitigate that. Once you’ve learned the basics, I still enjoy the second level strategy of figuring out when and where I want to win a location versus coming in second so that I can still buy the bonus thing but get my gems back. Cycling your gems, or acquiring gems, is a big part of the game. While you start with a nearly full supply for the first round; you will likely have to spend one or two of your cards in every round thereafter getting gems back from the board reserve. Obviously, if you spend a turn getting gems, that could be 25% of the round where you are making no progress at winning majorities on the board. Sure, there is some good timing aspects to getting gems; you might give your opponents a chance to declare their strategy as they play gems on their turn – but you’d still rather not have to draw gems more than you need to. You also have the chance to try to win rewards for tokens now, or to focus on spaces to help in future rounds – whether that be extra Bribery cards, Informant cards or the spaces which allow you to leave gems on the board for the next round. I like the open strategy of the new version as far as the Goons/buildings go versus the mission cards of the old version. It always seemed like someone had good luck with the right Mission card being flipped up at the right time. Here, everyone can see all the possible rewards, and everyone has the same access to them. Also, as players do not start with any Goons on the board, all players start with a more equal footing in this version. That being said, I liked the graphic presentation of the original. I actually liked the way you set up the tiles on the table as the board. 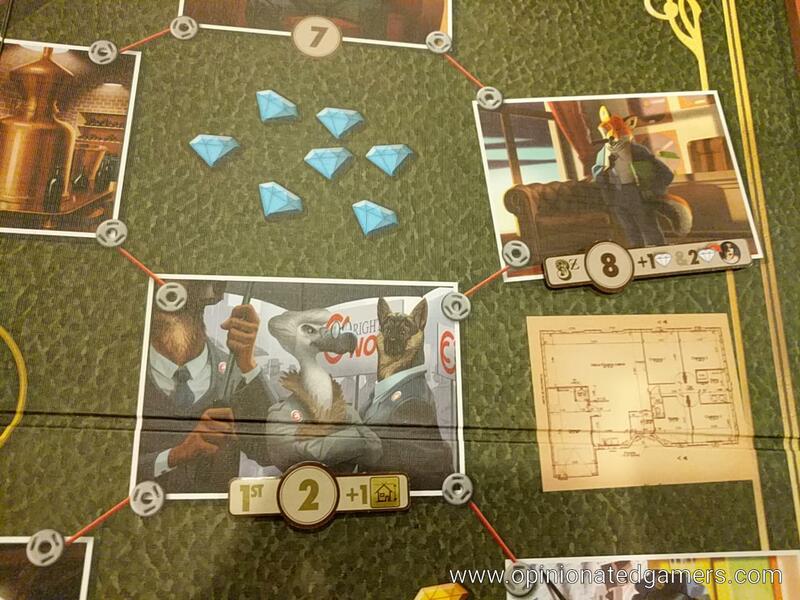 The board in Mafiozoo is a bit oversized, and I find that the artwork is a bit dark to see. Furthermore, despite the large board, the tiles which show the rewards and how they are won are super small and frustratingly difficult to read. I’m personally neutral to slightly down on the cartoon animal gangster theme, but I seem to be in the minority there from all the gamers I know who have played it. I think that is just a matter of personal taste. However, none of these issues is enough to mar the game experience. As I have been taking this game around to my gaming groups, I have been amazed by how many gamers haven’t played this or the original Louis XIV. For me, this was one of the original classic games, but I now realize how many gamers have come into the hobby recently – and with as many choices of new games as we have now – it’s not surprising that gamers haven’t gone into a back catalog to find a game from 2005! This new version will hopefully get this great design back on the table. Larry: I haven’t played the new version of this, but since Louis XIV is a big favorite of mine, I figured I’d weigh in here, particularly since Dale says the updated game is so similar to the original. I am indeed a Dorn fanboy–he’s one of my top 10 favorite designers of all time–and Louis XIV was one of his best. I love the process of figuring out the best way of playing the hand that you’re dealt, especially since the mechanics give you so many ways of doing so. I have to say that the new theme and graphics seem pretty unappealing, so I’ve really been in no hurry to try the updated version. OTOH, I always thought that the random end game scoring was easily the weakest part of the original, so since that’s been changed, maybe I should give the Mafia Mutts a chance. But no matter how you feel about the new theme, if this is the only version of Louis you have available to you, I highly recommend you try it out–it’s a terrific game, with a pretty unique feel. It’s an offer you can’t refuse! Fraser: I thought the theming and the way the playing surface was built actually worked really well with Louis XIV. We still have our original, so no need for this version in our household but well worth looking into if you don’t have the original. Mission cards vs. board locations. Eliminating the random draw is fine, but a subtler additional effect is that you simply can’t get to some spaces early. This might be fine – I didn’t analyze the abilities of the spaces compared to those on the three levels of mission cards in the original – but it certainly provides less variability. The scoring rules for the personages don’t change during the game in the new version. I don’t see a good reason for this change, but of course you could always flip the tokens using the original rules. The shield/neighborhood tokens work a bit differently; you can now take face-up tokens in some cases and none of the end-game bonus tokens can be used for majorities. The changes are probably for the better but not that big a deal either way. So basically a wash or maybe a slight improvement. However, I downgraded my rating for this version because of the physical presentation – it’s really, really dark and important information (like the scoring rules) is printed very small. The board is also much larger than it has any need to be. I would much rather play the original version even if the new rules are better overall.